According to Jay Smith of Pollstar, when it comes to the Top 50 Worldwide Tours, Bon Jovi was the top earner. 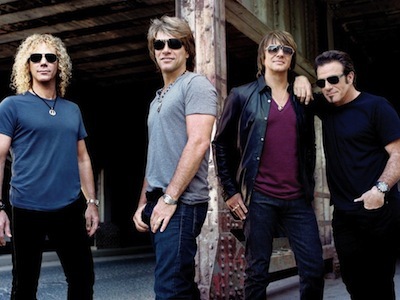 Bon Jovi grossed $142.1 million. With an average ticket price of $95.60, the band played 60 shows in 58 cities, sold a total 1,486,726 tickets and achieved an average gross of $2,450,476 per show. Another New Jersey act captured second place. With an average ticket price of $107.19, Bruce Springsteen & The E Street Band’s total tickets sold was 969,504 for 31 shows in 21 cities. The group’s average show gross was $4,948,700 for a total gross of $103.9 million. A total gross of $87.7 million was enough to put The Rolling Stones in the No. 3 position on Pollstar’s Top 100 Worldwide Tours chart while the same figures enabled the band to capture the top slot on our Top 100 North American tours. Sporting a heart-stopping average ticket price of $346.09, the original bad boys of rock played 18 shows in 11 cities, grossed an average of $7,969,276 per show and sold 253,296 tickets overall. Taylor Swift followed the Stones in North America, capturing the No. 2 position with a $58.5 million total gross. Ms. Swift earned her money by doing 37 shows in 27 cities, averaging $85.11 per ticket and $2,164,879 per show. Fleetwood Mac appearing in the third position on Pollstar’s mid-year North American Tours reminds us that the band’s absence from the concert stage only fueled fans’ desires to hear those classic songs performed live one more time. Scoring a total gross of $58.1 million during the first six months of the year, the band played 42 shows in 42 cities with an average ticket price of $107.80, resulting in an average per-show gross of $1,383,333. But the above figures, while fun to show & tell, merely offer a peak at the concert industry’s past six months. What you really need to do is feast your eyes on all the data contained within Pollstar’s Top 100 Worldwide and North American Tour charts.